More than just a catalogue. Get the right parts for your vehicle with just 3 clicks. Find the right part using various, product group specific criteria like width, height, thickness, number of wear indicators and many more. New to range items will be automatically displayed after each data update. We update Brakebook every week! Therefore, check frequently to see what’s new. 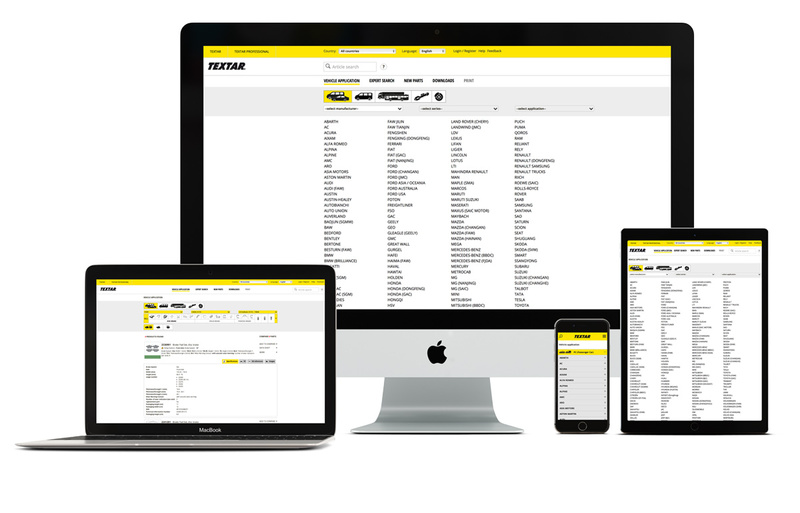 Create your own pdf catalogues for the entire product range, a selection of products, articles for particular manufacturers or even for special models. Free to download. Now with revised user interface and improved user interface. Textar articles can be easily identified and detailed information can be called up using the bar code. From now on, you can take a photo of the brake pad with the app. The uploaded photo will then be analysed by Brakebook, and you will receive the result on your smartphone in seconds. The catalogue App exclusively developed for TMD Friction uses the very latest catalogue data and offers user-friendly search options. The App targets the requirements needed to identify brake components. The catalogue data is automatically updated each week, no updating of the App required. Print on Demand enables registered users to create custom PDF catalogs according to their requirements – for the entire product range, some of the products, for products from specific manufacturers or even for specific models. Always up to date.